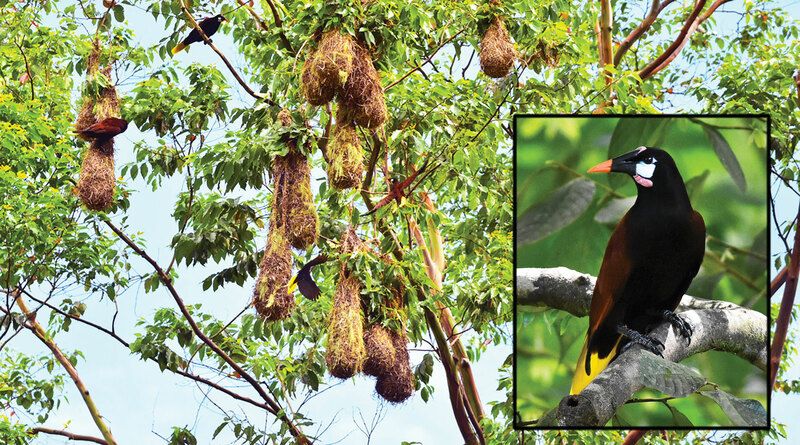 One of the more interesting birds found in our area is the Montezuma Oropendola. When you hear its call there will be no doubt about what it is. The sound is a very strange kind of gurgling. This class of bird is aptly named for the golden (oro) yellow color of its tail feathers and for the pendulum (pendola) type of movement that it makes when courting. It actually swings by its feet, dips down, and then back up again in repeated sequences. It has chestnut colored body feathers and an orange cone shaped bill. I think that shaped bill gives it an aerodynamic advantage during flight which is evidenced by the smooth sound it makes when flying overhead. They nest in colonies. The nests look like hanging baskets and hang delicately from very tall tress as protection from predators. The Montezuma Oropendolas are one of 3 types of Oropendolas found here in Costa Rica. The others are the Chestnut-Headed and the much less common Crested Oropendolas.